For the 5th year ! 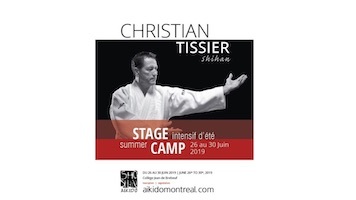 Shoshin Aikido Montreal is honoured to host an intensive summer camp with Christian Tissier Shihan. Beautiful weather, the Jazz Festival, and a variety of other cultural events make this the best time of year to visit Montreal. Come and enjoy five days of exceptional Aikido practice in one of North America’s most exciting cities. You will receive a confirmation e-mail once we receive your payment. Registration for lodging will close on June 25th, 2019. After this date, you may register (for practice only) at the door. --> WEAPONS Please bring your own weapons if at all possible. If you are travelling internationally and cannot bring your own weapons, please contact us and weapons will be made available for you. Looking forward to seeing you in large numbers — June 2019 in Montreal!